Since 1687, and continuously after 1726, the eastern mouth of the Niagara River has been home to a military installation. 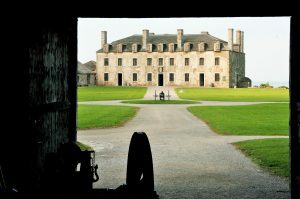 During its time under French, British, and for the first 141 years of American control, only a few Poles passed through the gates of what would be known as Fort Niagara. But with the outbreak of the Great War and the creation of the Blue Army, all that changed. With the onset of the World War I, Polish expats the world over saw the conflict with Germany as an opportunity to free their homeland. As early as 1914, the training of North American Poles to fight in Europe was discussed, but failed to materialize. With the entrance of the United States into the war in April 1917 the cause was taken up again. Soon a deal was struck where the French would finance and equip Canadian-trained Polish American soldiers. The units became known as the Blue Army, because of their signature blue uniforms in a French army cut. Soon 3,500 men were training at the newly-created Camp Kosciuszko at Niagara-on-the-Lake, Canada. 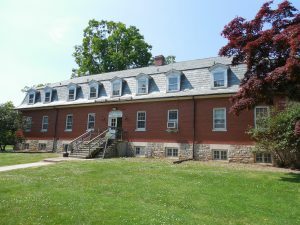 By November there were 4,000 recruits at the camp that was designed to house 1,200. Having no more room to expand in Canada, the Polish commanders began looking across the river at Fort Niagara. Despite the best efforts of army officials at Fort Niagara, their Blue Army soldiers would make the news once again in 1918. That February a full procession of Polish soldiers, led by a band, marched out of Fort Niagara all the way to the New York Central Freight Depot in Lewiston. From there they boarded trains heading to New York before being shipped to France. During the interwar years Polish American artist Eugene M. Dyczkowski would leave his mark at Fort Niagara. Born in Philadelphia, Eugene trained at the Buffalo School of Fine Arts before becoming a member of the Rockport Art Association and founder of the Polish Arts Club of Buffalo. In the late 1930s as part of the Works Progress Administration’s Federal Art Project (WPA/FAP) Dyczkowski was hired to paint a 90-foot mural for Fort Niagara’s Officers’ Club. Titled Defending Forts, the mural would recount a visual history of fortifications and solders. 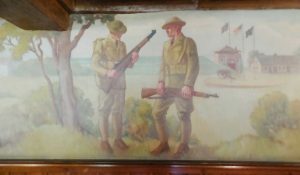 The mural completed in 1939 is particularly noteworthy as it contains one of the first representations of the M-1 Garand in art. The rifle, being inspected by a solder with the South Redoubt of Fort Niagara in the background, only went into mass production in 1937 with just a handful being made each day. Dyczkowski was exposed to the signature gun of World War II early on due to its testing at Niagara’s 1,000 yard range. The murals came under threat in the late 1990s, but a concerted preservation effort by the Polish American community forced the State of New York to recognize Defending Forts as an important piece of Western New York’s artistic heritage and left it in place. "A Dyczkowski Centenary Celebration." Am-Pol Eagle [Cheektowaga, NY] 27 May 1999: 1+. Print. "Don't Limit Input on Dyczkowski Murals." Am-Pol Eagle [Cheektowaga, NY] 19 Feb. 1998: 2. Print. Dickinson, David L. Four Grand Murals and the Artists of the Fort Niagara Officers' Club and Bachelor Officers' Quarters. Youngstown, NY: Old Fort Niagara Association, 2007. Print. Martin, David F. "Eugene M. Dyczkowski - Lusty Realist of Depression-Era Buffalo." Western New York Heritage Winter (2004): Print. Merritt, Richard. Training for Armageddon: Niagara Camp in the Great War, 1914-1919. Niagara-on-the-Lake, Ont. : Niagara Historical Society, 2015. Print. "Patriotism Stirs Poles at Banquet for Boys at Camp." Buffalo Courier [Buffalo, NY] 24 Dec. 1917: 5. Print. "Poles Get $1,790 In Tag Day Work." The Record [Johnson City, NY] 11 May 1918: 3. Print. "Polish Arts Club Preps for 60th Anniversary Polonaise Ball, Slawinski Mural Unveiling." Am-Pol Eagle [Cheektowaga, NY] 13 Oct. 2005: 1. Print. "Polish Soldiers Departed in True Military Style." Niagara Falls Gazette [Niagara Falls, NY] 15 Feb. 1918: n. pag. Print. "Polish Solders - War of 1812 - Six Nations." Tekawennake [Ohsweken, ON] 21 Sept. 2011: n. pag. Print. "Polish Soldiers to Use Fort Niagara.”The Evening News [Tonawanda, NY] 11 Nov. 1917: 5. Print.